The weather was a little better today than it was this weekend. I could actually breath as I ran my five mile tempo run. This was another afternoon out and back run from my office. 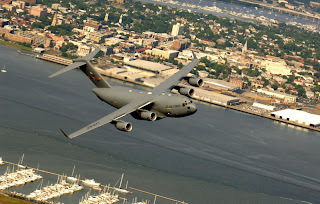 I ran down next to the Ashley River and and even got to see a C-17 flying overhead. It was an awesome run. I ran a warm up mile around Colonial Lake (9:50) and then headed out to the Ashley River. My three tempo miles were pretty good (8:10, 8:29, 8:05). I am just going to have to deal with the fact that my turnaround mile is always going to be slower. I finished up with a cool down mile (9:58) back on Queen Street. Only 11 more days until the Marine Corps Marathon! Click here to donate to the Injured Marine Semper Fi Fund.